Keaton has had several romantic associations with noted entertainment industry personalities, starting with her audition for the Broadway production of Play It Again, Sam, directed by Woody Allen. Their relationship became romantic after they had dinner after a late-night rehearsal. It was her sense of humor that attracted Allen. They briefly lived together during the production, but by the time of the film release of the same name in 1972, their living arrangements became informal. They worked together on eight films between 1971 and 1993, and Keaton has said that Allen remains one of her closest friends. Keaton was already dating Warren Beatty in 1979 when they co-starred in the film Reds. Beatty was a regular subject in tabloid magazines and media coverage, and Keaton became included, much to her bewilderment. In 1985 Vanity Fair called her "the most reclusive star since Garbo." This relationship ended shortly after Reds wrapped. Troubles with the production are thought to have strained the relationship, including numerous financial and scheduling problems. Keaton remains friends with Beatty. Keaton also had a relationship with her The Godfather Trilogy costar Al Pacino. Their on-again, off-again relationship ended after the filming of The Godfather Part III. Keaton said of Pacino, "Al was simply the most entertaining man... To me, that's, that is the most beautiful face. I think Warren was gorgeous, very pretty, but Al's face is like whoa. Killer, killer face." In July 2001 Keaton said of being older and unmarried, "I don't think that because I'm not married it's made my life any less. That old maid myth is garbage." Keaton has two adopted children, daughter Dexter (adopted 1996) and son Duke (2001). Her father's death made mortality more apparent to her, and she decided to become a mother at age 50. She later said of having children, "Motherhood has completely changed me. It's just about the most completely humbling experience that I've ever had." Keaton said she produced her 1987 documentary Heaven because "I was always pretty religious as a kid ... I was primarily interested in religion because I wanted to go to heaven." She has also said that she considers herself a Christian. Keaton is active in campaigns with the Los Angeles Conservancy to save and restore historic buildings, particularly in the Los Angeles area. Among the buildings she has been active in restoring is the Ennis House in the Hollywood Hills, designed by Frank Lloyd Wright. Keaton was also active in the failed campaign to save the Ambassador Hotel in Los Angeles (a hotel featured in Reservations), where Robert Kennedy was assassinated. She is an enthusiast of Spanish Colonial Revival architecture. Since 2005, Keaton has been a contributing blogger at The Huffington Post. Since 2006, she has been the face of L'Oréal. Keaton has served as a producer on films and television series. She produced the Fox series Pasadena, which was canceled after airing only four episodes in 2001 but completed its run on cable in 2005. In 2003, she produced the Gus Van Sant drama Elephant, about a school shooting. On why she produced the film, she said "It really makes me think about my responsibilities as an adult to try and understand what's going on with young people." Keaton has continued to pursue her interest in photography. She told Vanity Fair in 1987, "I have amassed a huge library of images—kissing scenes from movies, pictures I like. Visual things are really key for me." She has published several more collections of her own photographs, and has served as an editor of collections of vintage photography. Works she has edited in the last decade include a book of photographs by paparazzo Ron Galella; an anthology of reproductions of clown paintings; and a collection of photos of California's Spanish-Colonial-style houses. Keaton has also established herself as a real estate developer. She has resold several mansions in Southern California after renovating and redesigning them. One of her clients was Madonna, who purchased a US$6.5 million Beverly Hills mansion from Keaton in 2003. She received the Film Society of Lincoln Center's Gala Tribute in 2007. Keaton wrote her first memoir, Then Again, for Random House in November 2011. Much of the autobiography relies on her mother's private journals, which include the line "Diane...is a mystery...At times, she's so basic, at others so wise it frightens me." In 2012, Keaton's audiobook recording of Joan Didion's Slouching Towards Bethlehem was released on Audible.com. Her performance was nominated for a 2013 Audie Award in the Short Stories/Collections category. ^ Clarke, Gerald (August 24, 2017). "Inside Diane Keaton's House in Beverly Hills". Architectural Digest. Retrieved May 8, 2018. ^ Philip French. "Then Again: A Memoir by Diane Keaton – review". The Guardian. Retrieved October 7, 2015. 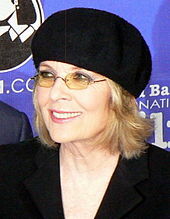 ^ a b c "Diane Keaton: The Next Hepburn" Rolling Stone. June 30, 1977. ^ Emma Brockes. "Diane Keaton: 'I love Woody. And I believe my friend'". The Guardian. Retrieved October 7, 2015. ^ "Diane Keaton and Morgan Freeman's Real Estate Adventure". The New York Times. Retrieved July 23, 2016. ^ "'Then Again': Actress Diane Keaton looks back - today > books". TODAY.com. Archived from the original on October 17, 2015. Retrieved October 7, 2015. ^ a b c d e Diane Keaton interview. Fresh Air, WHYY Philadelphia. January 1, 1997. Retrieved February 27, 2006. ^ Nancy Griffin. "American Original" More Magazine. March 2004. ^ a b Diane Keaton: A Nervous Wreck on the Verge of a Breakthrough. Movie Crazed. 1974. Retrieved February 22, 2006. ^ a b Dominic Dunne. "Hide and Seek with Diane Keaton". Vanity Fair. February 1985. ^ a b c Terry Keefe. "Falling in love again with Diane Keaton". Archived from the original on November 2, 2004. . Venice Magazine. January 2004. Retrieved from the Wayback Machine, November 4, 2004. ^ Jack Nicholson Falls Hard for the Romantic Comedy, "Something's Gotta Give". Interview With Jack Nicholson. December 2003. Retrieved March 24, 2006. ^ "Diane Keaton". Internet Broadway Databas. Retrieved May 30, 2008. 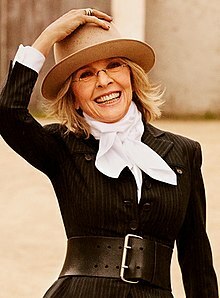 ^ Diane Keaton: The Comeback Kid. CBS News. May 3, 2004. Retrieved February 22, 2006. ^ Behind the Scenes: A Look Inside. Featurette from The Godfather DVD bonus features. ^ a b c "Love, Death and La – De – Dah" Time. September 26, 1977. ^ Lax, 2000, p. 204. ^ Sean Smith. "Sweet on Diane" Newsweek. December 2003. ^ a b c Q&A: Diane Keaton. CBS News. February 18, 2004. Retrieved February 21, 2006. ^ Paul Tatara. Keaton walks away with 'Marvin's Room'. CNN. January 13, 1997. Retrieved February 27, 2006. ^ Antonia Quirke. Something's Gotta Give review Archived October 11, 2006, at the Wayback Machine. Camden New Journal. Retrieved March 20, 2006. ^ "100 Greatest Performances of All Time". Premiere magazine. April 2006. ^ "Annie Hall (1977)". Classic Hollywood Style. Retrieved October 7, 2015. ^ "Signature Threads". AMCTV. Archived from the original on August 19, 2005. Retrieved February 20, 2006. ^ a b Hugh Hart. Let's talk – Diane Keaton. San Francisco Chronicle. December 11, 2005. Retrieved February 23, 2006. ^ Joan Juliet Buck. "Inside Diane Keaton". Vanity Fair. March 1987. ^ The ever-changing star Archived December 6, 2008, at the Wayback Machine. Sunday Post magazine. Retrieved from the Google cache, December 16, 2005. ^ Long, Robert (June 26, 2003). "Diane Keaton: A Photographer's Role". The East Hampton Star. Archived from the original on July 25, 2008. Retrieved August 25, 2008. ^ a b "The Making of Reds". Vanity Fair. March 2006. ^ Vincent Canby. Beatty's Reds with Diane Keaton. The New York Times. December 4, 1981. Retrieved February 24, 2006. ^ Roger Ebert Reds Movie Review. The Chicago Sun-Times. January 1, 1981. Retrieved December 11, 2018. ^ Stanley Kauffmann. "The Little Drummer Girl." The New Republic 191. November 5, 1984. ^ Kempley, Rita (December 12, 1986). "Crimes of the Heart." The Washington Post. Retrieved January 15, 2019. ^ Kael, Pauline (November 16, 1987). "Baby Boom". The New Yorker. Condé Nast. Retrieved March 7, 2016. ^ a b c Henri Behar. 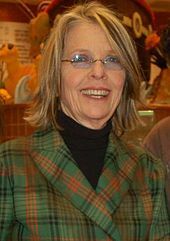 Diane Keaton on The First Wives Club Archived March 22, 2006, at the Wayback Machine. Film Scouts interviews. December 22, 1996. Retrieved March 26, 2006. ^ Hal Hinson. The Good Mother. The Washington Post. November 4, 1988. Retrieved March 1, 2006. ^ Vincent Canby. "Film: A Documentary, Diane Keaton's 'Heaven'". The New York Times. April 17, 1987. Retrieved March 24, 2006. ^ Interview with film actress Diane Keaton. Indian Television. October 10, 2003. Retrieved March 25, 2006. ^ Barbara Shulgasser. "Great 'Bride II' cast carries retread plot". San Francisco Chronicle. December 8, 1995. Retrieved March 3, 2006. ^ Hal Hinson. The Godfather, Part III review. The Washington Post. December 25, 1990. Retrieved March 1, 2006. ^ Dinitia Smith. Picking Up The Legos And The Pieces. The New York Times. May 8, 1994. Retrieved November 6, 2010. ^ Ansen, David (August 30, 1993). "Play It Again, Woody". Newsweek. New York City: Newsweek Media Group. ^ a b Brad Stone. "Defining Diane". More magazine. July/August 2001. ^ Roger Ebert. Review- Marvin's Room. January 10, 1997. Retrieved March 25, 2006. ^ National Headliner Awards. Archived August 20, 2012, at the Wayback Machine Retrieved May 9, 2010. ^ Peter Travers. Town & Country. Rolling Stone. May 9, 2001. Retrieved March 3, 2006. ^ Merle Ginsberg. "Adopting Was the Smartest Thing I've Ever Done. Ladies' Home Journal. January 2004. ^ Roger Ebert. Something's Gotta Give. Chicago Sun-Times. December 12, 2003. Retrieved February 20, 2006. ^ Kopp, Carol (December 12, 2005). "Keaton Grows Into Matriarch Role". CBS News. Retrieved February 9, 2011. ^ Travers, Peter (December 1, 2005). "The Family Stone Review". Rolling Stone. Retrieved February 9, 2011. ^ Murray, Rebecca. "Diane Keaton Talks About Playing a Meddlesome Mother in Because I Said So". About.com. Retrieved February 9, 2011. ^ Morris, Wesley (February 2, 2007). "Looking for the perfect man has never been more painful". Boston Globe. This is a sloppily made bowl of reheated chick-flick cliches. ^ Booth, William (December 29, 2007). "Rated PU, Unfit for Any Audience". The Washington Post. Retrieved February 14, 2008. ^ Hall, Sandra (September 26, 2008). "Diane's Career Is Dyin'". New York Post. Retrieved February 10, 2010. ^ Honeycutt, Kirk (January 15, 2008). "Mad Money A Bankrupt Comedy". Reuters. Retrieved February 10, 2010. ^ Johnson, Richard (January 23, 2008). "Cold Run". New York Post. Archived from the original on January 11, 2009. Retrieved February 9, 2011. ^ "Today's Ten: Worst Movies Of 2008". New York Post. Retrieved December 3, 2008. ^ Nasson, Tim (November 6, 2010). "Morning Glory – BEHIND THE SCENES". WildAboutMovies.com. Archived from the original on October 11, 2011. Retrieved July 15, 2011. ^ "Morning Glory Official Movie Site: Production Notes". Retrieved January 23, 2011. ^ "The latest weather forecast is partly funny". New York Post. November 14, 2010. Retrieved November 24, 2010. ^ Morning Glory – Reelviews Movie Reviews. Reelviews.net. November 10, 2010. Retrieved November 24, 2010. ^ Schwartz, Terri (September 23, 2010). "Kevin Kline And Diane Keaton Cast In Lawrence Kasdan's Latest Film, 'Darling Companion'". MTV. Retrieved July 18, 2011. ^ Renninger, Bryce J.; Loria, Daniel (October 14, 2010). "In the Works: "Darling Companion" from "Big Chill" Director, Social Anxiety Monsters & New Docs". IndieWire.com. Retrieved July 18, 2011. ^ a b Burr, Ty (May 18, 2012). "'Darling Companion' unleashes late-life frustrations". Boston Globe. Retrieved October 9, 2012. ^ Sneider, Jeff (June 24, 2011). "Robin Williams Invited To 'Big Wedding'". Variety. Retrieved July 18, 2011. ^ "The Big Wedding". rottentomatoes.com. April 26, 2013. Retrieved October 7, 2015. ^ Lumenick, Lou (April 25, 2013). "'The Big Wedding' has something borrowed, something blue and nothing funny". New York Post. Retrieved April 25, 2013. ^ "'And So It Goes...' For Michael Douglas & Diane Keaton". Indiewire. October 18, 2012. Archived from the original on January 20, 2013. Retrieved October 29, 2012. ^ Smarp (September 25, 2013). "Morgan Freeman in Myrtle Ave, Brooklyn, NY, USA". Archived from the original on September 26, 2013. Retrieved September 25, 2013. ^ Smarp (September 25, 2013). "Diane Keaton in Myrtle Ave, Brooklyn, NY, USA". Archived from the original on September 26, 2013. Retrieved September 25, 2013. ^ "Ruth & Alex". Toronto International Film Festival. Archived from the original on August 19, 2014. Retrieved August 17, 2014. ^ "Keaton first woman to win Golden Icon Award". The Washington Post. October 3, 2014. Retrieved October 7, 2015. ^ Matt Mueller (October 3, 2014). "Golden Icon Winner Diane Keaton Gets Real at Zurich Film - Thompson on Hollywood". Thompson on Hollywood. Archived from the original on October 17, 2015. Retrieved October 7, 2015. ^ a b c Grady, Pam (November 7, 2015). "Diane Keaton's 'Love the Coopers' ties a bow around the holidays". San Francisco Chronicle. Retrieved February 29, 2016. ^ "Love the Coopers (2015)". Rotten Tomatoes. Retrieved February 9, 2016. ^ "Love The Coopers (2015)". Box Office Mojo. Retrieved January 20, 2016. ^ Galuppo, Mia (December 15, 2015). "Goldie Hawn, Bette Midler, Diane Keaton Reteam for Netflix's 'Divanation'". The Hollywood Reporter. Retrieved February 28, 2016. ^ Jonathan Papish (June 17, 2016). "On Screen China: Despite Upstream Struggle, Pixar's 'Dory' Could Haul It In". China Film Insider. Retrieved June 17, 2016. ^ "Finding Dory (2016) - International Box Office Results - China". Box Office Mojo. Retrieved October 13, 2016. ^ Stanhope, Kate (July 28, 2015). "Diane Keaton to Star Opposite Jude Law in HBO and Sky Series 'The Young Pope'". The Hollywood Reporter. Retrieved February 28, 2016. ^ "Emmy Awards: "The Young Pope", il record di "Saturday Night Live" e le candidature di Nicole Kidman, Anthony Hopkins e gli altri". Corriere della Sera. July 14, 2017. ^ Ritman, Alex (October 20, 2015). "AFM: Diane Keaton, Brendan Gleeson to Find Love in 'Hampstead'". The Hollywood Reporter. Retrieved February 28, 2016. ^ "Mystery of Hampstead Heath squatter whose home inspired Hollywood romcom". Guardian. Retrieved July 15, 2018. ^ "Hampstead". rottentomatoes.com. Retrieved July 15, 2018. ^ "Hampstead". Box Office Mojo. Retrieved July 15, 2018. ^ "Book Club (2018)". Rotten Tomatoes. Fandango. Retrieved July 15, 2018. ^ "Book Club (2018)". The Numbers. Retrieved July 15, 2018. ^ Lax, 2000, p. 243. ^ Lax, 2000, p. 308. ^ Diane Keaton's Given Up On Men Archived February 26, 2011, at the Wayback Machine, WENN, July 2, 2001. Retrieved March 21, 2006. ^ Paul Fischer. Diane Keaton: Happily Single and Independent. Film Monthly. December 2, 2003. Retrieved March 26, 2006. ^ a b Joan Juliet Buck. "Inside Diane Keaton" Vanity Fair. March 1987. ^ People and Accounts of Note. June 5, 2006. The New York Times. Retrieved November 6, 2010. ^ Helen Bushby, "School shootings film hits Cannes", BBC News, May 18, 2003. Retrieved February 25, 2010. ^ Diane Keaton's good homework pays off. Contact Music. May 16, 2003. Retrieved March 21, 2006. ^ "Then Again". PenguinRandomhouse.com. Retrieved October 7, 2015. ^ Weller, Sheila (December 2, 2011). "Diane Keaton: Soulful, Unselfish Maturity". The New York Times. Retrieved December 18, 2011. ^ "Diane Keaton on Joan Didion, Working with Robert De Niro in The Big Wedding, and Her Love of Frank Ocean". VF Daily. August 31, 2012. Retrieved April 26, 2013. ^ "HARVARD THESPIANS HONOR KEATON WITH PUDDING POT". DeseretNews.com. February 14, 1991. Retrieved September 26, 2018. ^ "Past Muse Award Honorees | New York Women in Film & Television". www.nywift.org. Retrieved September 26, 2018. ^ "Golden Apple Awards (1996)". IMDb. Retrieved September 26, 2018. ^ "Elle Women in Hollywood Awards (1998)". IMDb. Retrieved September 26, 2018. ^ "Film Hall of Fame: Actors - Online Film & Television Association". www.oftaawards.com. Retrieved September 26, 2018. ^ "US Comedy Arts Festival (2004)". IMDb. Retrieved September 26, 2018. ^ "Honorees Database | Hollywood Film Awards". Hollywood Film Awards. Retrieved September 26, 2018. ^ "Lincoln Center to honor Keaton". The Hollywood Reporter. Retrieved September 26, 2018. ^ "Golden Camera, Germany (2014)". IMDb. Retrieved September 26, 2018. ^ "Zurich Film Festival (2014)". IMDb. Retrieved September 26, 2018. ^ "American Film Institute - 2017 Diane Keaton Tribute". www.afi.com. Retrieved September 26, 2018. ^ "David di Donatello Awards (2018)". IMDb. Retrieved September 26, 2018.